Get a perfect introduction to the sights, sounds, and atmosphere of St. Thomas along with transportation the best shopping on the island! A professional driver and tour guide will lead you on a fun-filled journey through St. Thomas, starting with a ride to downtown Charlotte Amalie, where you’ll have access to great shopping. Take an opportunity to purchase souvenirs, specialty items, spirits, and more from the unique shops, and shop freely along the Waterfront or Main Street area. After a morning of retail therapy, you will return to your vehicle for an afternoon of sightseeing. Visit some of the best local spots for spectacular photo opportunities. Take in the entire island from panoramic views at Mountain Top, the highest point in St. Thomas, and the world famous banana daiquiri! 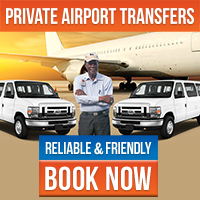 Transportation is provided in a van, mini-van, SUV, or an open-air Safari bus for larger groups. All guides are licensed and certified professional drivers with extensive knowledge of the U.S. Virgin Islands. So don’t miss out on this great sightseeing and shopping experience. Make the most of your time on the beautiful island of St. Thomas and book your sightseeing and shopping excursion today! The 11:00 AM departure is not available for Hotel Guests. It is available for late arrival cruise ship guests only. Note: The 11:00 AM departure is not available for Hotel Guests. It is available for late arrival cruise ship guests only. All our taxis are fully certified and authorized in St. Thomas, USVI. All open-air cabs are called “Safaris” and can hold up to 25 people. We have been operating in St. Thomas for 15 years and are well-known for exciting and energetic tours. Our cruise ship accommodation features a departure at 9:00 AM and a return time of 1:00 PM to meet cruise ship schedules. Cancellations must be made at least 48 hours in advance for a full refund. Any cancellations made within 48 hours of your scheduled tour will receive no refund. If your ship does not arrive to port due to weather or unforeseen circumstances, contact us for a full refund. No-shows will be charged the full price. Operators reserve the right to cancel any tours with a full refund due to weather or other circumstances.